Ohio's Burning River In Better Health 40 Years Later Forty years ago, Ohio's Cuyahoga River, which had been compared to "an open septic tank," caught fire. Cuyahoga became a rallying cry for environmentalists and sparked the creation of the EPA and the Clean Water Act. Now the river teems with fish and wildlife. 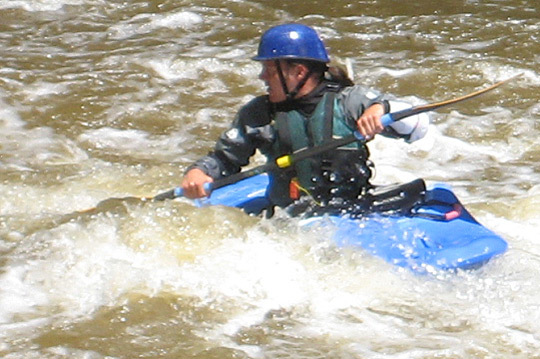 Mike Larkin braves the rapids on the now-cleaner Cuyahoga River. 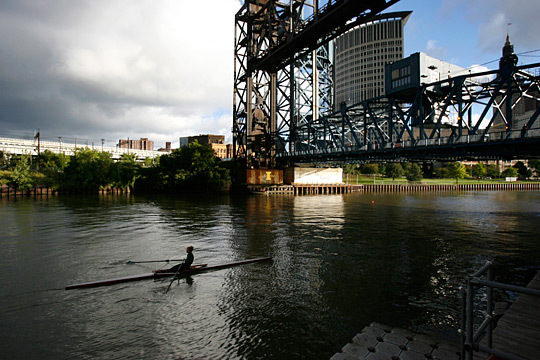 A woman rows down the Cuyahoga River towards the starting line to begin a race on Sept. 15, 2007, in Cleveland. 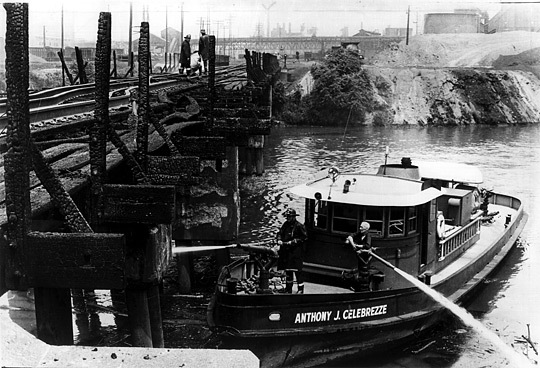 Firefighters put out the remains of a bridge over the Cuyahoga River in Cleveland that burned on June 22, 1969. View of the heavily polluted water on the Cuyahoga River, Ohio, 1968. One year later, on June 22, 1969, a piece of molten steel fell into the river and lit fire to industrial waste on the river. Forty years ago Monday, a train crossing a low bridge over the Cuyahoga River sparked, igniting oil-soaked debris in the water. It wasn't the first time there was a fire on that heavily polluted waterway, which flows through the cities of northeast Ohio. Nor was it the biggest. But it was 1969, and the environmental movement was looking for a symbol. The fire was just that. To this day, if you tell someone you live in Cleveland, you're likely to be asked, "Doesn't your river catch on fire?" Never mind that in the middle of the 20th century, rivers in industrial cities across the country caught on fire all the time. Never mind that it has been four decades since the Cuyahoga's infamous blaze — which lasted only about a half-hour. That image of a sludge- and oil-filled river on fire persists. But today's river could not be more different. To see how different, some workers with the Northeast Ohio Regional Sewer District are shocking fish. From July to October, John Rhoades and his crew take a boat out and lower electrical poles into the water to briefly stun, net and release the fish. On this particular day, they are finding dozens of kinds of fish — from redhorses to steelhead. The Cuyahoga teems with fish. Another good sign: Many of the fish they find hate pollution. 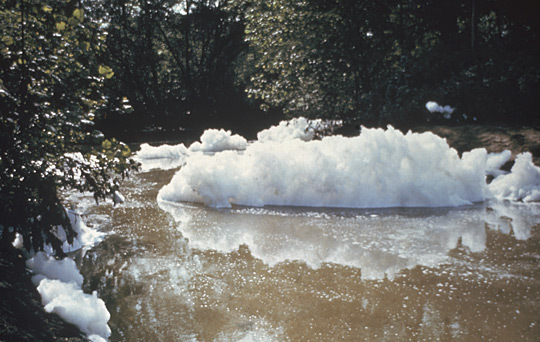 In the early 1980s, when scientists started keeping track, parts of this river were so polluted that virtually nothing could survive. Many of these same sections are now rated as exceptional fish habitats. Some parts of the river near Akron, Ohio, still have problems with sewage and runoff, but in much of the Cuyahoga, beavers, herons and even bald eagles thrive. "It was sort of an open septic tank with junk floating on top," says Frank Samsel, who spent years cleaning up the river on his boat, Putzfrau, which is German for "cleaning lady." "Anything that you can imagine that could float or was soluble was in the river." So, how did the Cuyahoga go from a lifeless, opaque river of sludge to water that, while far from pristine, is the cleanest it has been since the Industrial Revolution? "I think it was 90 percent news media that did it," Samsel says. Specifically, Time magazine. The fire initially generated barely a mention in the news. But a few weeks after the incident, Time was getting on the burgeoning environmental bandwagon and published an article that mentioned the fire. "Some river!" the magazine mockingly wrote. A lot of people read that issue; it was the same one with news of Ted Kennedy's Chappaquiddick incident and the moon landing. So, while that may have been unfair to Cleveland, the story about the burning Cuyahoga became an environmental rallying cry — one that led to the creation of the Environmental Protection Agency and, eventually, the Clean Water Act. Trains still cross the Cuyahoga at the site of the fire. The debris under the bridge is now natural — logs and such. But farther up the river in Akron, there's another big change: The public is beginning to see this river as a destination. 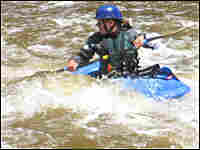 Mike Larkin and some kayaking buddies are about to take their boats on some of the river's rapids. He says the reputation hasn't quite caught up with the reality. "We get a funny look when we say we actually get into the river and kayak it," Larkin says. On this 40th anniversary of the fire that led to this dramatic cleanup, the city held a concert on its banks, declaring the river reborn. The EPA, which was in large part formed out of the fire, now declares parts of the river fully restored. River advocates say instead of reaching for an easy joke about the Cuyahoga, it might be a better idea to grab a paddle or a fishing rod. Dan Bobkoff reports for member station WCPN.